Recipe courtesy of Sir Kensington’s. Adjust oven rack to middle position and heat oven to 350 degrees Fahrenheit. Spray a 9” by 3” round baking pan with nonstick cooking spray. Line the bottom with parchment paper and spray it again. Set aside. In a large bowl, whisk together mayonnaise, granulated white sugar, and vanilla extract until blended. Add the eggs, one at a time until well incorporated. Add the baking powder and salt. Whisk to combine. Add the all-purpose flour alternately with the whole milk until mixture is homogenous. Gently fold in the holiday sprinkles. Pour batter into the prepared baking pan. Make sure to smooth the top with a rubber spatula. Bake until toothpick inserted in center comes out clean, about 45 minutes to an hour. Cool cake in the pan for 15 minutes then turn out onto a cooling rack and let the cake completely cool, about 2 to 3 hours. Once cool, use a long serrated knife to trim the domed top and then,cut the cake into thirds. Set aside. In a mixer fitted with a paddle attachment, beat together butter, salt, and vanilla until light and fluffy. At low speed, gradually add the powdered sugar, one cup at a time. Add the heavy cream. Whip until smooth. Set aside 1 cup of buttercream in a small bowl and tint with a few drops of green food coloring. In another bowl, set aside another cup of buttercream and tint with a few drops of red food coloring. Leave the remaining buttercream as is. 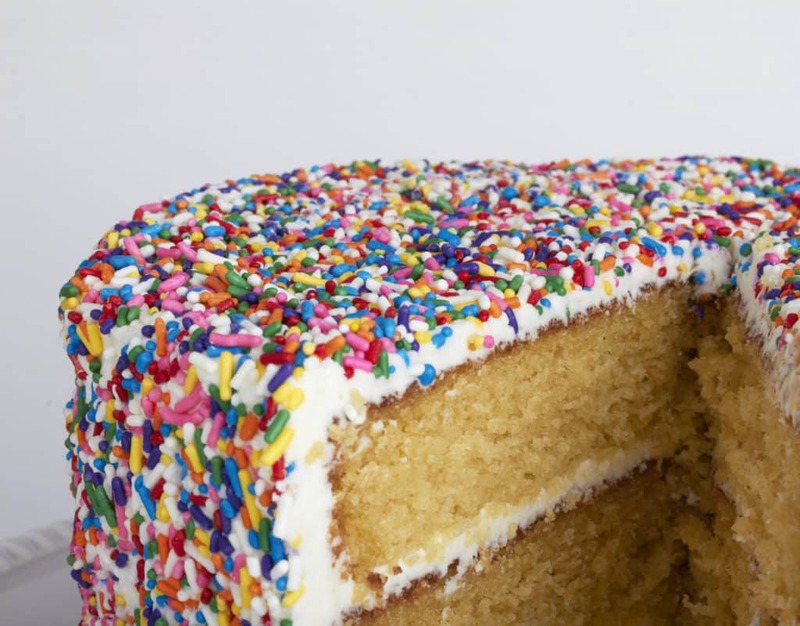 Place the first layer of confetti cake on a cake stand or serving platter. Put 1 cup of the green buttercream on top and spread evenly. Position the second layer of confetti cake and press to adhere. Put 1 cup of the red buttercream on top and spread evenly. Place the last layer of confetti cake and press lightly. Cover the entire cake with a thin coat of buttercream. This is what you call a “crumb coat”, it will ensure that there is no stray crumbs once you apply the final frosting on the outside. Refrigerate for 30 minutes to set. Finish icing the cake by using an offset spatula. Frost the top and the sides. Press the holiday sprinkles on the bottom edges and the top edges to make it festive. Enjoy!